It is obvious that Scursa has evolved from a smaller ancestor, one that would climb trees and glide from point to point. However, Scursa is now of a tremendous size and weight, enough to easily destroy the average tree. For this reason, Scursa will scale cliff faces or, when in a bind, very thick, strong trees before beginning its descent. Scursa is an omnivore, targeting live prey only when necessary. Rumors circulate that they have begun to feed on the blood of unsuspecting victims, however Monster Researchers insist that this is merely fantasy. 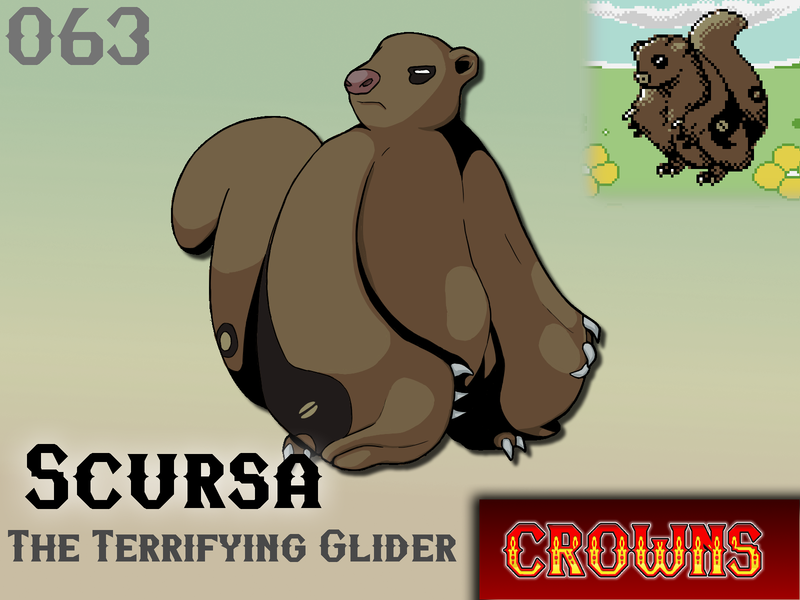 The thick, gliding growths along its sides make very effective cloaks, distributing the force of impacts or attacks from other large monsters, and making it difficult to target Scursa's vital organs. Scursa's habit of holding its arm up to its face and cloaking its body when startled has done little to diffuse its growing dracula-esque reputation. Will Scursa make your team?